As I write this, I am on an aircraft surrounded by disaster response teams. Police officers, Forest Service officers, rapid response medical teams – all of us were on the islands of St. John and St. Thomas doing what we could to help those communities (and in our case, their animals) recover from the destruction left behind by Hurricane Irma. Now we are leaving, en route to the continental US through San Juan to wait out the next storm before we can return to continue our work. The mood on the plane is somber. Many of us were torn when we were given the order to evacuate. Hurricane Maria is bearing down on the Caribbean, and will slash through these islands in a day or so impacting already weakened infrastructures and tattered homes. 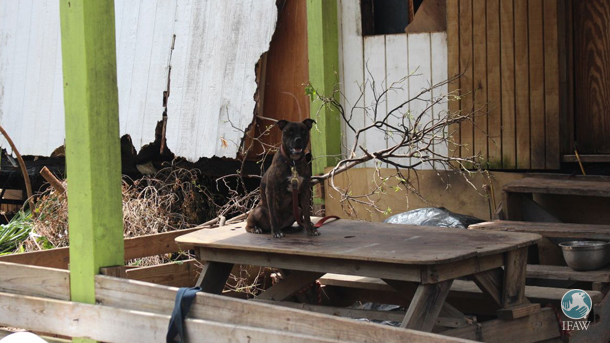 Our teams of IFAW responders on the US Virgin Islands of St. John and St. Thomas had just started our assessments for post-disaster needs of owned and unowned community animals before receiving evacuation orders. The people we met there are doing all they can to care for their animals. Before we arrived, however supplies were running low. Animal food for large and small community animals was being rationed and caregivers were anxious about securing meals for the animals in their care. Luckily we were able to deliver 2,000 pounds of dog food to St. John donated by PetSmart Charities and Royal Canin through GreaterGood.org, with more supplies on their way. Ryan Moore, the shelter manager at the St. John Animal Care Center, has worked tirelessly to ensure that the dogs and cats under his care are receiving the food, water, and love that they need during this intense and stressful time. The cats and dogs we met there are incredibly sweet. Zuma, Dallas, LuAnn and so many others met our team with unconditional love and affection. Ryan manages a dedicated team of volunteers who ensure that all of the dog and cat kennels are clean, that cats get the socializing they need, and each dog is walked at least twice a day. When we have heard so much about the looting and violence in Irma’s wake, the dedication shown by Ryan and his team of staff and volunteers to these helpless animals restores my faith in humanity. We also met Dana Bartlett who has adopted so many of St. John’s iconic white donkeys. Thankfully her donkeys, and all the wild donkeys we met along the way, are faring very well. Dana has secured hay for her herd, and we witnessed wild donkeys foraging through the plants that have survived the storm. Her chickens, however lost their home when it was flattened by the hurricane. She is scrambling to provide shelter for them as Maria barrels down. 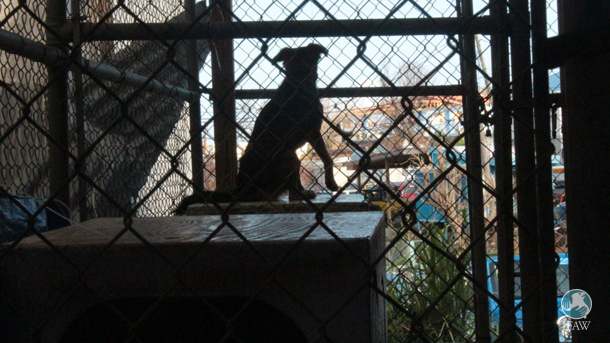 At the Humane Society of St. Thomas we also saw incredible dedication to their community and the animals in their care. 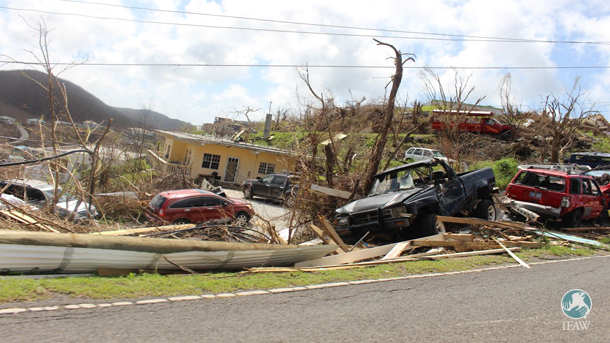 While the shelter on St. Thomas fared well structurally throughout Irma, shelter staff and volunteers literally lost everything to the hurricane -- houses, vehicles, businesses -- but thankfully they never lost hope. Each day people from the island arrived to provide daily care for animals; food, water and lots of emotional support. It seemed to me that helping the animals of St. Thomas was therapy, a way of giving back when they themselves had lost so much. 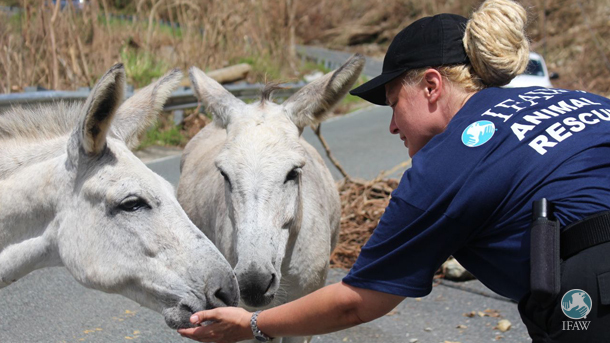 Thankfully the IFAW team on Antigua and Barbuda have completed their assessment of the needs for wildlife and community animals on those islands, and have been evacuated safely. 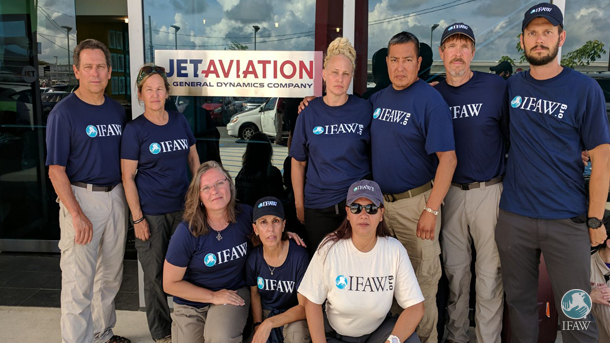 IFAW Disaster Response teams are eager to remobilize once Maria passes through the region. The absolute devastation caused by being hit by storm after storm means these communities and their animals need our help more than ever. We will keep you updated on our continuing work in the region. Please check back here for more information.